Nothing special today - perhaps a wave 4 and the beginning of a fifth wave right before the close. The best time to short is after 5 waves down (i. e. wave 1) and 3 up (i. e. wave 2). The important question now is how far wave 2 will retrace. 1 - The all time high. The candle stick pattern looks very similar to today: A doji was followed by a big red candle which closed at the low of the week. The next week was up and retraced more than 62% of the first wave. In both cases the new downtrend started with some strong down days. The following second subwave of the first downwave of Intermediate (3) was very short, less than a 50% retracement. 3 - Today. Again a big red candle which closed at the low of the week. 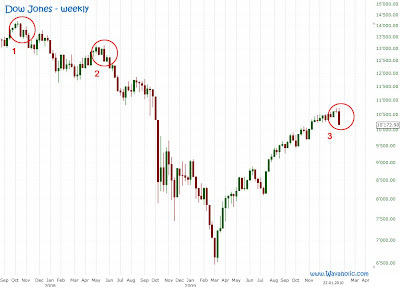 There are two fractals in the recent past which call either for a big or a short wave 2. So it may be quite difficult to short the top of wave 2 since we may not get the usual 50-62 % retracement.